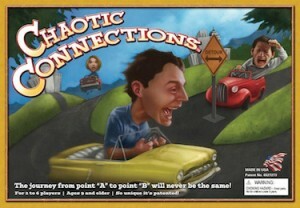 I had the opportunity to play Chaotic Connections at Gen Con this year. It is a map game base on the interstate highway of the U.S.If you are familiar with the game Ticket to Ride, it has almost the same game play. The object of the game is to connect all the cities you aregiven with tiles which represent miles of road. At the start of the game aplayer is given 5 city cards and he/she must choose three cities they want toconnect. The person to their left then chooses one for that person. Each personis given three action cards from a deck. On a turn a person draws a card andplays one. Unlike Ticket to Ride a player is allowed to build off of another person’sroads. Also there are cards that allow you to play road blocks and detours to preventyour fellow players from completing their highway. It’s a neat game, which requires strategy and the ability tonot feel too bad for fellow players you might screw over. A must have forpeople who like map games.You can pick a copy up here.